From the authors of the best-selling The Second Machine Age, a leader’s guide to success in a rapidly changing economy. 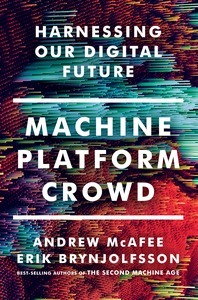 MIT’s Andrew McAfee and Erik Brynjolfsson know what it takes to master this digital-powered shift: we must rethink the integration of minds and machines, of products and platforms, and of the core and the crowd. In all three cases, the balance now favors the second element of the pair, with massive implications for how we run our companies and live our lives. In the tradition of agenda-setting classics like Clay Christensen’s The Innovator’s Dilemma, McAfee and Brynjolfsson deliver both a penetrating analysis of a new world and a toolkit for thriving in it. For startups and established businesses, or for anyone interested in what the future holds, Machine, Platform, Crowd is essential reading. “Even Silicon Valley is surprised by the speed and scope of change today. The best way to stay on top of it is to understand the principles that will endure even as so much gets disrupted. This book is the best explanation of those principles out there.” — Eric Schmidt, former CEO of Google, executive chairman of Alphabet, Inc.